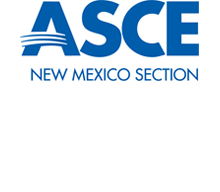 The New Mexico Section of the American Society of Civil Engineers (ASCE) consists of members from all corners of New Mexico. The NM Section provides support, tools and resources for NM ASCE members to network, learn, and collaborate. We welcome all New Mexico Civil Engineers to join us in strengthening the profession in our state. Please visit here to learn how you can become an ASCE member or here to find out how you can become involved here in New Mexico! Please check back here often to find out about upcoming meeting of our Younger Members Group as well as our Northern Branch and Southern Branch. There are links at the top of the page regarding upcoming events, ASCE NM Officer contacts, recent awards, recent newsletters and other useful resources. The ASCE NM Section is proud to present DREAM BIG NEW MEXICO. This engaging video is for children and adults alike who are interested in engineering and what engineers do. Watch our video on YouTube!